All offers are subject to change, see dealer for complete details. *All Offers are with approved credit. Does not include $199 administration fee. Security deposit waived with approved credit. Offers cannot be combined and is subject to availability. All-New 2019 RAV4 LE FWD with Blind Spot Monitor [Stock# W190866] Lease for $225 per month for 36 months with $3,599 due at signing. Cap Cost is $26,932. OR Purchase for $26,281 when you finance with TFS. TFS Non-Subvened APR Cash up to 72 Months when purchased at Standard TFS Rate. MSRP is $27,325. All-New 2020 Corolla Hybrid LE [Stock# W200003] Lease for $258 per month for 36 months with $3,995 due at signing. Cap Cost is $23,645. OR Purchase for $22,995. MSRP is $24,129. 2020 preliminary mpg estimates determined by Toyota. 2020 EPA-estimated 53 city / 52 Highway / 52 combined mpg for Corolla LE hybrid. Actual Mileage will vary. All-New 2019 Prius XLE AWD [Stock# W190610] Lease for $349 per month for 36 months with $4,500 due at signing. Cap Cost is $30,776. MSRP is $31,596. All-New 2019 Avalon Limited [Stock# W190178] Up to $5,800 Off MSRP after $2,250 rebate. MSRP is $44,775. All-New 2019 Tacoma TRD Sport 4×4 Double Cab V6 [Stock# W190882] Lease for $459 per month for 36 months with $4,995 due at signing. Cap Cost is $44,495. OR Purchase for $43,800 after $1,000 rebate. MSRP is $47,037. Dealer installed Upgrades Include: TRD PRO BLACK WHEELS, BF GOODRICH ALL TERRAIN TKO2 TIRES, BLACKOUT TOYOTA EMBLEMS & BADGING, BLACKOUT GRILL OUTLINE, PREDATOR TUBE STEPS, STOWAWAY ROOF RACK, BLACK TAILGATE TACOMA LETTERING, BODY GRAPHICS, BED SIDE GRAPHICS, HOOD GRAPHICS and TINTED WINDOWS. All-New 2019 4Runner TRD Off Road Premium [Stock# W190805] Lease for $525 per month for 36 months with $4,995 due at signing when leased through U.S. Bank. Cap Cost is $48,182. Dealer installed Upgrades Include: TRD PRO OFFICIAL TOYOTA GRILL, TRD PRO BLACK WHEELS, BF GOODRICH ALL TERRAIN TKO2 TIRES, BLACKOUT TOYOTA EMBLEMS & BADGING, BLACKOUT LINE-X FRONT BUMPER, BLACKOUT LINE-X REAR BUMPER, PREDATOR TUBE STEPS, TINTED WINDOWS, and TRD STAMPED SKID PLATE – SPECIAL RED TRD LETTERING. All-New 2019 Tundra SR5 4×4 Crewmax with Crew-Dominator Upgrade [Stock# W190712] Lease for $559 per month for 36 months with $4,995 due at signing. Cap Cost is $52,690. OR Purchase for $51,995 after $2,500 rebate. MSRP is $56,024. Dealer installed Upgrades Include: BUMPER GUARD BODY KIT, LED BODY KIT LIGHTS, FENDER FLARES, BODY KIT SIDE FINS, TAILGATE SPOILER, TAILGATE BODY KIT, TRD PRO BLACK WHEELS, COOPER DISCOVER ALL TERRAIN TIRES, BLACKOUT TOYOTA EMBLEMS & BADGING, BLACK TAILGATE TUNDRA LETTERING, and TINTED WINDOWS. All-New 2019 Camry XSE V6 with Black Top Pano Roof [Stock# W190577] Lease for $397 per month for 36 months with $4,500 due at signing. Cap Cost is $34,937. OR Purchase for $33,537 after $750 rebate. MSRP is $36,701. All-New 2019 Camry SE [Stock# W190564] Lease for $258 per month for 36 months with $3,599 due at signing. Cap Cost is $25,881. OR Purchase for $24,481 after $750 rebate. MSRP is $26,952. All-New 2019 Corolla SE Hatchback [Stock# W190839] Lease for $207 per month for 36 months with $2,999 due at signing. Cap Cost is $21,970. OR Purchase for $20,320 after $1,000 rebate. MSRP is $22,374. 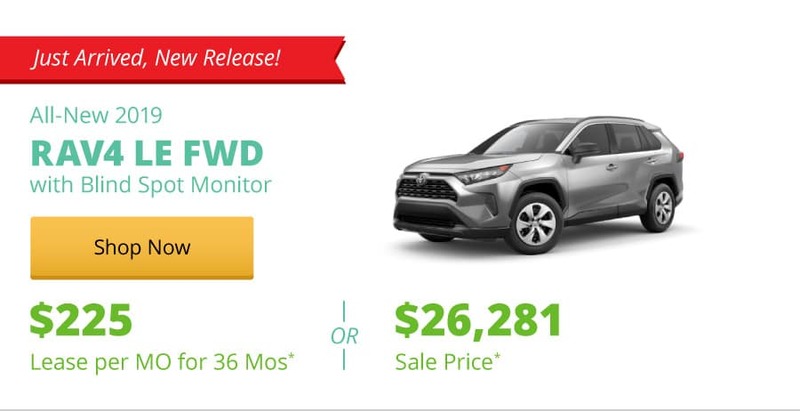 All-New 2019 Highlander LE Plus V6 AWD [Stock# W190604] Lease for $325 per month for 36 months with $4,595 due at signing. Cap Cost is $35,652. OR Purchase for $35,002 after $1,500 rebate. MSRP is $39,198. All-New 2019 Corolla LE [Stock# W190210] Lease for $189 per month for 36 months with $2,995 due at signing. Cap Cost is $19,873. OR Purchase for $17,223. MSRP is $20,134. All-New 2019 Yaris LE [Stock# W190154] Lease for $185 per month for 36 months with $2,995 due at signing. Cap Cost is $18,909. OR Purchase for $16,259. MSRP is $18,470. All-New 2019 Sienna LE FWD [Stock# W190922] Lease for $375 per month for 36 months with $4,500 due at signing. Cap Cost is $35,273. OR Purchase for $31,623. MSRP is $36,424. All-New 2019 C-HR XLE FWD [Stock# W190939] Lease for $225 per month for 36 months with $2,995 due at signing. Cap Cost is $23,964. OR Purchase for $21,903. MSRP is $24,403. All discounts after applicable rebates. Applicable rebates provided by TFS. Does not include taxes, license, title fees or insurance. Includes Destination, Gas and Advertising. Offers end 04/30/2019. **All offers are with approved credit. Does not include $199 administrative fee. Security deposit waived with approved credit. Offers cannot be combined and is subject to availability. 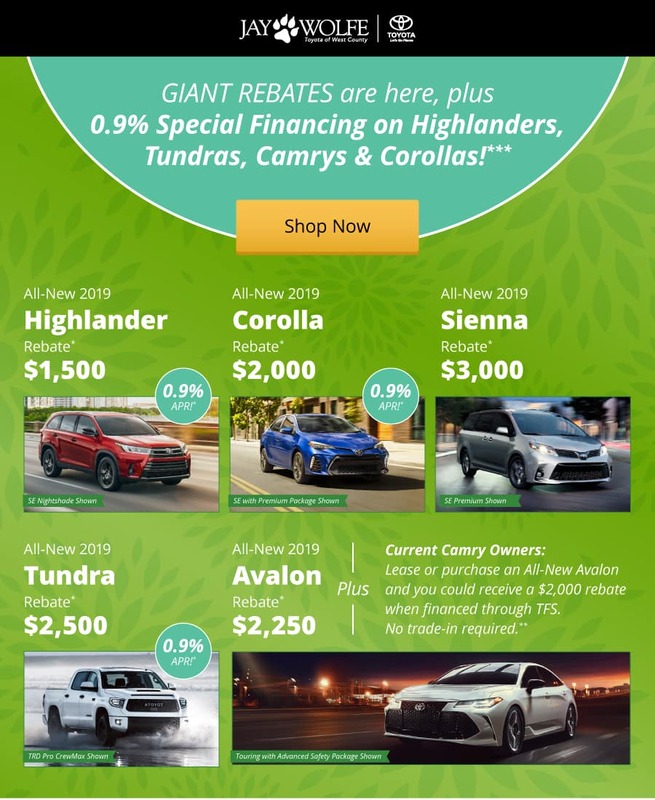 The Camry Loyalty Cash offer provides current owners with up to $2,000 towards the lease or purchase an All-New 2019 Avalon or Avalon Hybrid. Customers must provide proof of ownership of a Camry Gas or Hybrid vehicle. Acceptable proof is vehicle registration or valid proof of insurance showing the make, model, customer name and address. If transferrable within the household, the address on the current vehicle registration or other proof provided must be the same as that of the purchaser/leasee of the new eligible 2019 Avalon Gas or Hybrid vehicle. 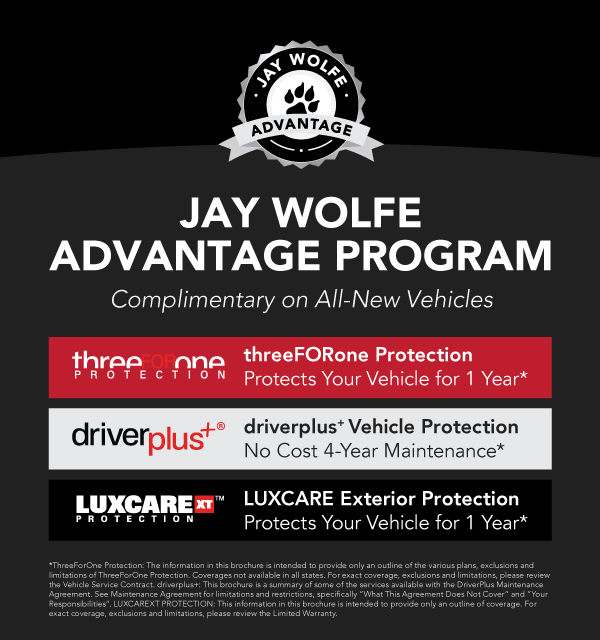 Dealer and customer must complete and sign the Camry Loyalty Cash certificate and it must be submitted with required supporting documents to Toyota_Incentives_Support@Toyota.com for redemption by April 30,2019. [Example: All-New 2019 Avalon Limited [Stock# W190178] Up to $5,800 Off MSRP. MSRP is $44,775.] Offer expires 04/30/2019. ***All offers are with approved credit. Does not include $199 administration fee. Offers cannot be combined and is subject to availability. Down payment may be required. 0.0% APR financing for 60 months with $16.67 per $1,000 borrowed. 0.0% APR financing for 72 months with $13.89 per $1,000 borrowed. 0.9% APR financing for 60 months with $17.05 per $1,000 borrowed. 1.9% APR financing for 60 months with $17.48 per $1,000 borrowed. 2.9% APR financing for 60 months with $17.92 per $1,000 financed. Annual Percentage Rate available to buyers with approved Tier 1+ through Tier 1 (excellent) credit through Toyota Financial Services. College Grad and Military Rebates are not included. Applicable rebates provided by TFS. Offers end 04/30/2019.